Donny Cates' GUARDIANS OF THE GALAXY hasn't reached its full potential yet but it's a solid read regardless. 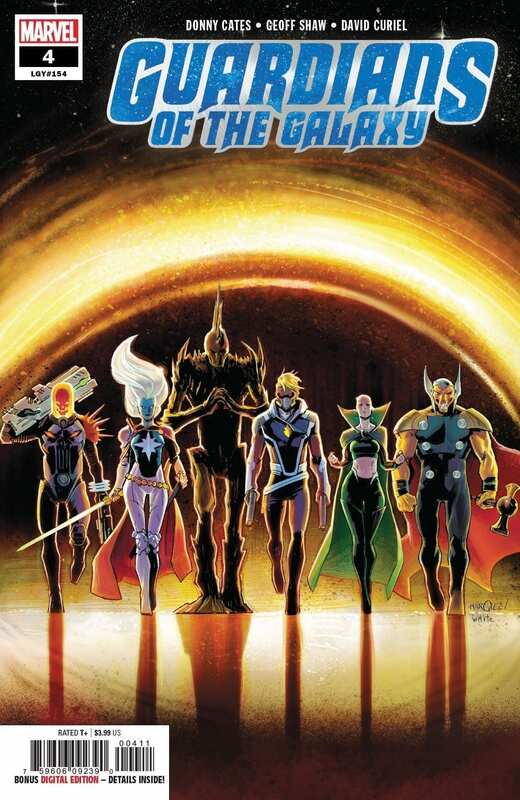 Donny Cates and Geoff Shaw pit Guardians against Guardians as the intergalactic dysfunction continues. 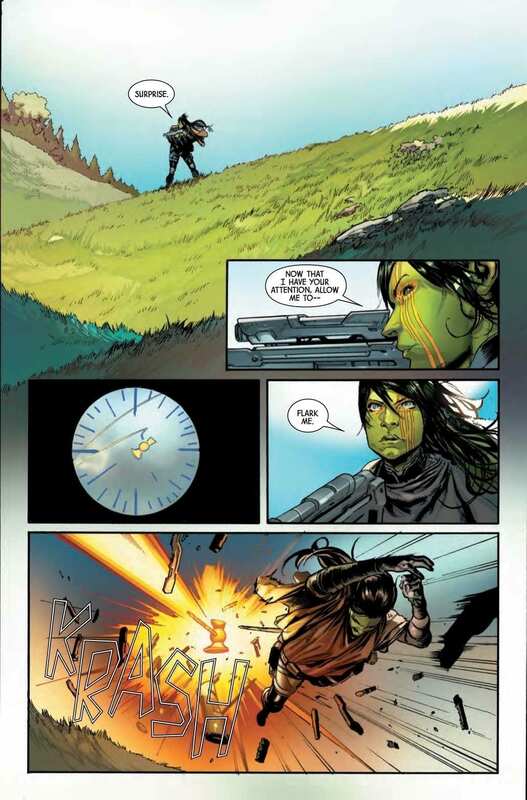 GUARDIANS OF THE GALAXY #4 brings Gamora back into the fold. The race for Gamora leads to a fight between both teams of Guardians and one Peter Quill makes the ultimate sacrifice…again. We get a glimpse at Rocket and his killer battle fortress before Gladiator and company wipe the floor with our heroes. Donny Cates continues to slowly develop his lineup of galaxy guardians but they’re nowhere near fully formed. This is still very much a dysfunctional family that seems to grow farther apart the more they venture forward. Gamora is the only one who sees that Thanos’ posthumous threat is merely another game but she gets dragged into the chaos regardless. She throws herself into the mix, leading to Star-Lord taking a possibly fatal shot for her. It seems like Peter Quill sacrifices himself to save a teammate every six issues or so that he’s featured in, it’s getting rather stale. This time in particular feels hollow as Peter hasn’t really had any time to shine or charm yet in this young series. He’s also sacrificing himself for somebody who was just a straight-up villain in Gerry Duggan’s Infinity Wars. It’s comics, we know this obviously isn’t the end for Quill but it should still matter a tiny bit that he’s willing to pay the ultimate price for his former teammate. Donny Cates has quickly put together an impressive run of great comic book series, however this one may not be fully cooked yet. It has a lot going for it; the lineup, creative team, antagonists, dilemma, and concept. Guardians Of The Galaxy is still just missing something, maybe that’ll change once Rocket emerges from his fortress inevitably. If we’ve learned anything from the brilliant Abnett & Lanning run, it’s the more Nova the better. Richard Rider brings the fight to our team’s front door and the ensuing battle is brief but beautiful. What this issue lacks in character up front, it makes up for in style and action. Geoff Shaw and colorist David Curiel keep the edge of this book sharp. Groot’s mo-hawk isn’t the only punk thing about Guardians Of The Galaxy; it’s the atmosphere and attitude as well. The aesthetics established early on work wonders, we just need to inject some charm into some of these characters. This may not be the finest hour of Donny Cates so far but it’s far from being a bad read. 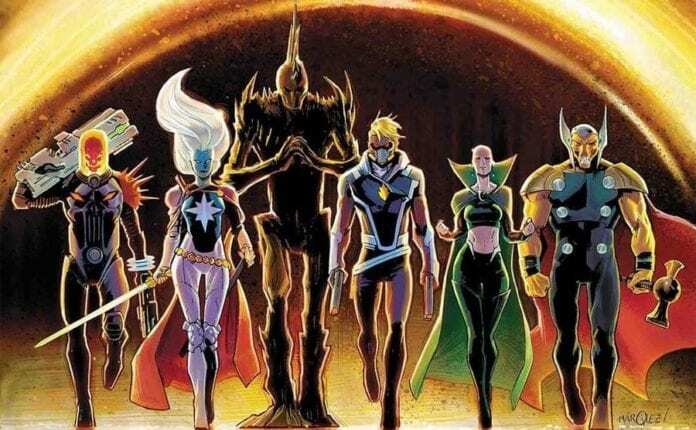 It’s still a solid cosmic Marvel tale and gives us most of our favorite Guardians, there just needs to be more heart and intent throughout. Having Star-Lord be down in the dumps drags the entire experience down a peg. Beta Ray Bill has been the standout star so far. Cates knows how to extract what he needs from the hammer-wielding horse without going too far or saying too much. 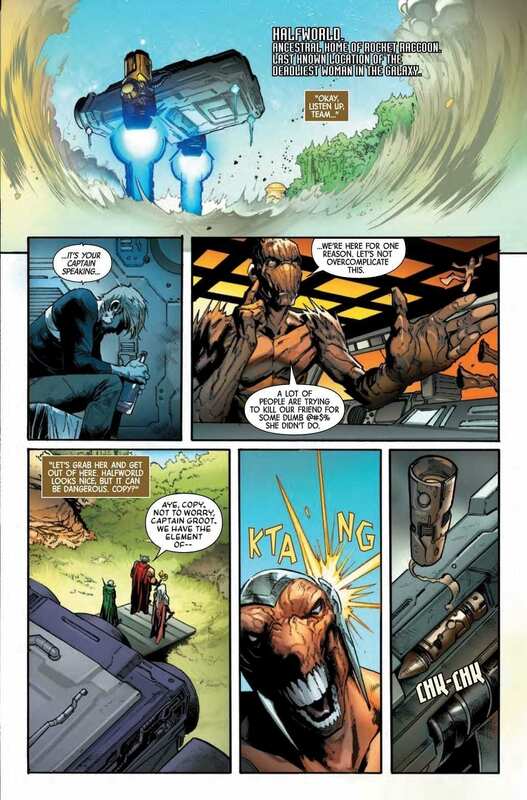 Despite it still being weird that he’s speaking full sentences, Groot has been the biggest source of joy. He reluctantly serves as the reader, desperate to get the family back together fully formed. Guardians Of The Galaxy #4 is a solid read that’s still figuring itself out as we head towards some more exciting cosmic chaos. We’ve come to expect nothing but instant classics from Donny Cates, maybe this time around it’s going to take a bit longer for his vision to become clear.